The plugin currently always applies the default virtual model "Modifiable.vm". Individual markers are created and attached to source files for each duplicate code block occurrence and each component involved in a component cycle group. This makes it easier for the developer to spot a problem while editing a source file, but results in a higher number of markers. No markers are created for ignored issues, because the developer cannot resolve them in the IDE. Markers are only generated for elements that are part of the currently monitored workspace. If a Sonargraph module cannot be mapped to an Eclipse project, no issues and resolutions for elements contained in that module are shown. Detected issues are shown in the standard Eclipse Problems and Tasks views. The view options allow to group problems by "Type" as shown in the screenshot. It is also possible to configure a new Problems view via the Problems view's view menu and exclusively show the Sonargraph issues by selecting "Configure Contents..." and filtering for the Sonargraph issues as shown below in the screenshot. This configuration dialog can be opened via Problems view's view menu "Configure Contents...". The same grouping and filtering options are applicable on the standard Eclipse Tasks and Markers views. Sonargraph calculates logical namespace cycle groups, i.e. physical namespaces are merged on module or system level. 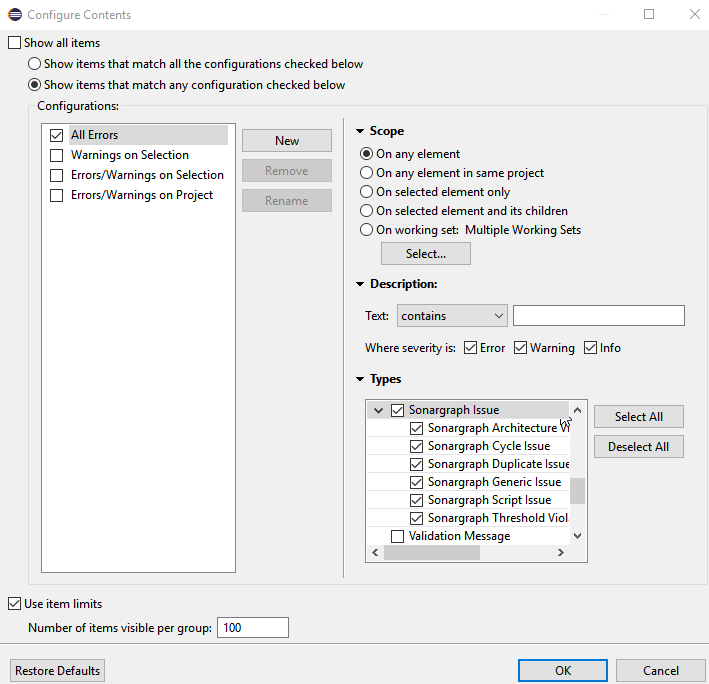 The Sonargraph Cycle Groups view can be opened via the main Sonargraph menu or via the context menu of a Sonargraph Cycle Issue marker. More detailed cycle group analysis (including possibilities to break them up) should be done with the Sonargraph Architect application as described in Section 7.9, “ Analyzing Cycles ”.